It’s been pretty apparent that Justin Schultz has struggled in his third professional season. Regardless of his performance, there is value in keeping him on the roster. 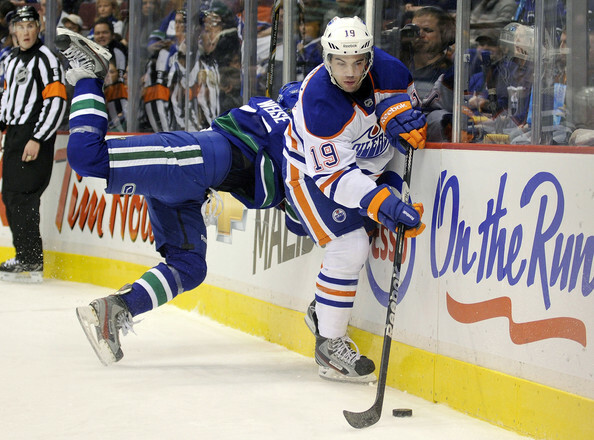 He’s still a prospect who’s still a ways away from being a good quality NHL defensemen. For now, we’re seeing glimpses of his offensive potential, which if developed and deployed correctly, could be a huge piece of the Oilers foundation. What irks most fans is that he’s not performing well even though he gets a lot of the prime minutes and has (very) strong support from management. You really can’t blame him for the Norris trophy comments. I’m sure MacT would take that one back since it put a lot of unneeded attention and pressure on a 22 year old. Schultz did use a loop hole to leave the Ducks and cash-in on a new deal with the Oilers, something that others have done as well, but that shouldn’t skew the fact that he’s still a young prospect finding his way in the NHL. Who you can blame for Schultz overall performance and development is the Oilers management team. Three of the players, Matt Carle, Paul Martin and Jordan Leopold, made the jump straight from college into the NHL. We know Schultz did spend some time in the AHL with Hall, Eberle and RNH during the lockout, but you can be assured that he would’ve been pushed right into the NHL had the lockout been avoided. The key thing is to surround the prospect with defensemen in their absolute prime (age 26-30, 300+ NHL games) to carry most of the load while the young prospect can be deployed in the right situations. Here’s a look at the defensive rosters that the three rookies from college had in their first and second professional seasons along with their total time-on-ice (TOI). Now you can make a case for each of the Oilers defenseman and their positive or negative impact on Schultz. The main thing I wanted to illustrate is that if the Oilers had looked at legitimate comparables, they may have seen the value in surrounding young Schultz with quality defensemen in their primes. Both Carle and Martin benefited from being on well built rosters with their development in mind, and have established themselves as reliable NHL players. It would be a huge benefit to the young prospects like Schultz, Klefbom and Marincin if the Oilers can land some experienced, in-their-prime, defenders this summer. That might mean reduced minutes for the young players, but it at least takes some of the burden away and lets them flourish in more specific situations (i.e., power play, offensive zone starts). Finally, I just want to re-emphasize the realistic expectations we should have on Schultz. 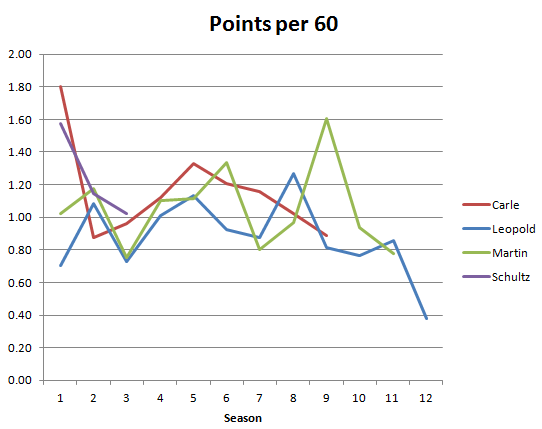 Below are the points per 60 by season for Schultz and each of the three comparable players. Very high level, but it might help to temper some of the Norris trophy expectations. Just a side note: Bruce made a great point yesterday on Lowetide’s show regarding some of the excessive comments against Craig MacTavish. Critique his work all you want, and pick apart every one of his moves, but there’s really no need for the personal insults. Part of being a fan is about furthering our knowledge about the game, and the cheap shots to people running the team does nothing to push the discussion along.